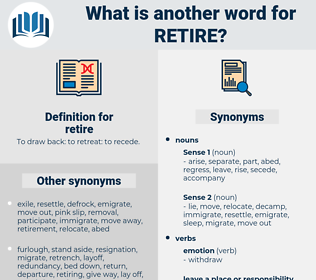 What is another word for retire? To draw back: to retreat: to recede. resign, quit, terminate, reimburse, repay, cancel, disengage, revoke, cease, discontinue, retrieve. enter, approve, join, advance, remain, stay, increase, arrive, begin, come in, continue. 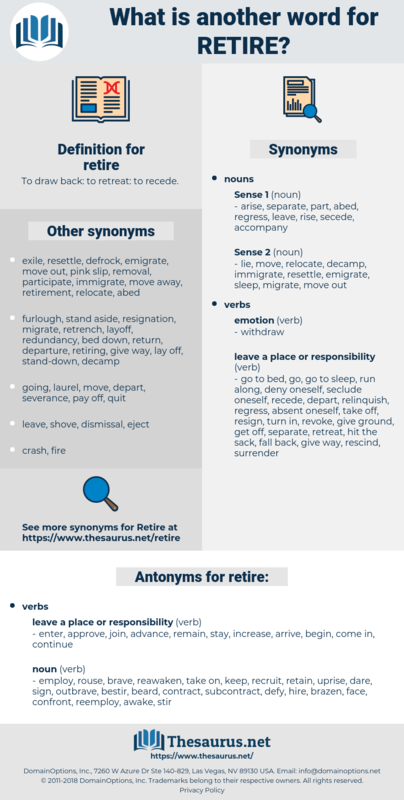 employ, rouse, brave, reawaken, take on, keep, recruit, retain, uprise, dare, sign, outbrave, bestir, beard, contract, subcontract, defy, hire, brazen, face, confront, reemploy, awake, stir, engage, shift, Rehire, Reawake. Kennedy, too, was ordered to retire. You will have your own room to which you can retire. reader, rotatory, rood-tree, rioter, rather, reorder, ready-to-wear, retry, reiter, rotary, rudra, raider, raw weather, red water, rotter, roe deer, router, Rooter, rotor, root hair, rewriter, red deer, rat terrier, retro, redheader, rudder, radiator, rider, ratter, red-header, retiree, radar, radyera. back off, back down, chicken out, bow out, pull out. superannuate, withdraw, bow out, drop out. jade, fatigue, tire, pall, weary. chuck out, toss, cast away, cast out, dispose, put away, throw out, fling, discard, toss out, toss away, throw away, cast aside. fire, discontinue, give the sack, can, lay off, give notice, quit, terminate, stop, dismiss, resign, send away, cease, recall, give up, force out, leave office, step down, displace, sack, give the axe.